Peony Rose is a expansive all over floral. Peony Rose, as it’s name suggests, sees a large heavy head of roses and peonies taking center stage to a supporting cast of veined leafy foliage and stems which softly bow under the weight of these full blooms. This expansive design could be used to best advantage for floor length curtains with a suitably contemporary heading such as eyelets. Extra large scatter or floor cushions would also show the pattern off well, particularly if mixed with the Flo stripe. A multipurpose decorative home interior designing fabric, suitable for medium upholstering, bedding, draperies, valances, cornices, decorative pillows, accent pieces. High end UK Textiles "steeped in style and imbued with innovation, ensuring that Prestigious continues to lead the way in establishing, maintaining and influencing home furnishing trends around the world". All are on a practical 100% cotton in a combination of colourways, all based on natural hues enhanced by bright summer sunlight. 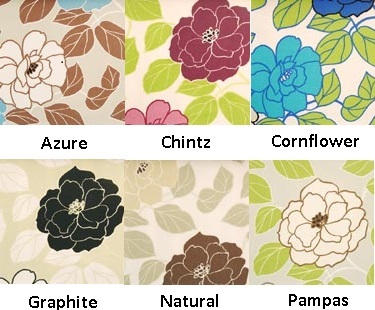 These are multipurpose decorative home interior designing fabrics, suitable for medium upholstering, bedding, draperies, valances, cornices, decorative pillows, accent pieces. Peony Rose is a expansive all over floral in the ‘Summer Garden’ range; a contemporary collection capturing the relaxed lifestyle of sun-kissed days in a summer garden. Peony Rose, as it’s name suggests, sees a large heavy head of roses and peonies taking center stage to a supporting cast of veined leafy foliage and stems which softly bow under the weight of these full blooms. This expansive design could be used to best advantage for floor length curtains with a suitably contemporary heading such as eyelets. Extra large scatter or floor cushions would also show the pattern off well, particularly if mixed with the Flo stripe. Shadowleaf is a tranquil leaf trail design contemporary cotton print. Crisply outlined stylised leaves in block colours amble peacefully over a plain base cloth. The design is calm in comparision to the bold, lively floral Peony Rose. These florals are balanced by a discreet companion stripe called Flo. Flo is a discreet multi-tonal stripe which plays companion to the florals. The bold vertical stripes in Flo make it perfect for crisp Roman blinds to contrast or balance curtains in one of the all-over florals, or for an eye-catching splash of colour as designer wall-art panels. Other Prestigious Textiles Collections Schindler's Fabrics, in our continuing effort to bring the new and unique to American home decorating is now bringing England's Prestigious Fabrics online to the USA.